1951 A Year To Remember on VHS. Starring Salvador Dali, Ivor Novello, Princess Margaret. Original concept: Paul H. Feldman. Series consultant: David Frost. 1990. 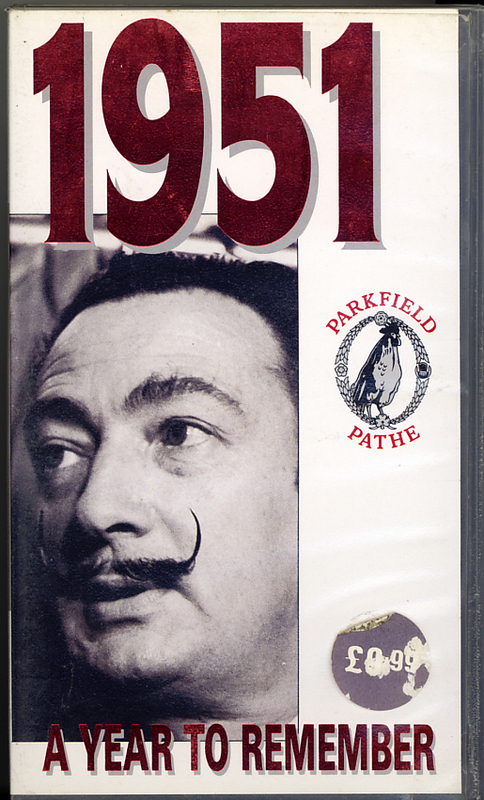 1951 A Year To Remember — Salvador Dali, enfant terrible of the art world exhibited some of his extraordinary works at a London gallery. Ivor Novello, also renowned for his artistic musical talent, died in the year that “Kiss Me Kate” and “South Pacific” opened in the same city. Britain’s new fighter plane caused gasps of exhilaration as did the Easter Hat Show held in London though some women were more concerned about the meat shortage. These and so many other events were highlights on 1951. All are featured on the hour-long video which is one of a collection of ten in the fifties series and of course only one of forty in the entire “Year To Remember” range. History in motion — the perfect gift-for yourself, or for someone you care about. Not found on Region 1 DVD.